While I did do some field grafting and budding at Wisley, I had never done any bench grafting. 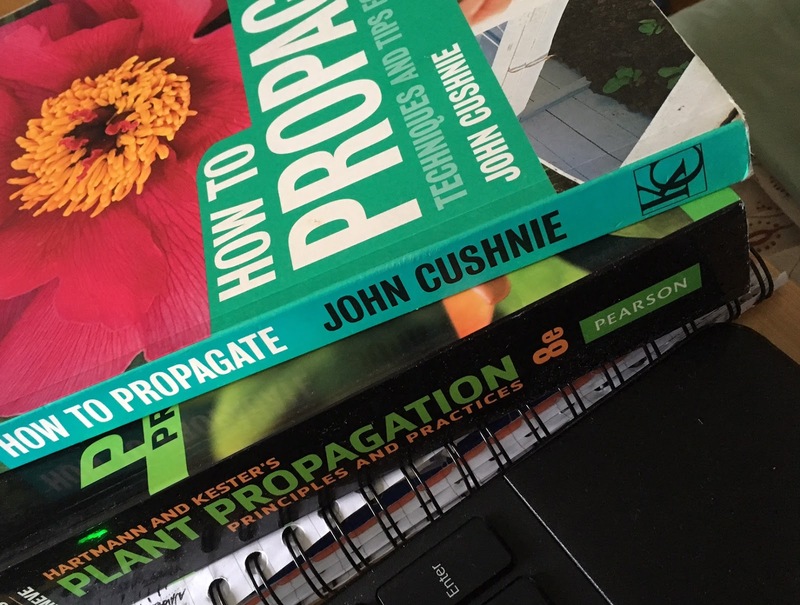 The opportunity to practise, however has come now, as I am studying to complete my RHS level 3 Diploma in the Principles and Practices of Horticulture, and grafting is an examinable skill. Grafting is mainly done at the earliest time of spring, just before bud break, and in the late summer, when new wood has had time to ripen stiff enough. In order to prepare us for the July test of budding and side veneer grafting, we got some training in whip and tongue, which is based on the same basic cut. The most important requirement for grafting is a sharp knife, without which you have no control of the cut. To sharpen the knife you need a water or oil stone. I have an Arkansas oil stone that is just wide enough. After oiling the stone, you have to place the blade whole on the stone, finding the original sharpening angle of the bevel. You only sharpen the bevelled side of the blade, and you have to get the angle right, or you won't get it sharp. Once you settle on the right angle, place the other hand on the tip of the blade and pull towards you, with a steady motion. Then you start again, repeating for five/six times. It has to be shave-proof! To finish off, remove the burr on the other side of the blade, by placing it flat on the stone and using gentle round motions. Once you have a sharp knife, you need to hold your wood safely. I have previously nipped my fingertips and therefore find it easier to wear preventative plasters (namely on the thumb of the knife hand), but we were taught a foolproof way to hold the wood to avoid that. Hold the wood close to where you are going to make the cut, palm down. Then grab the blade quite close, to wield control, and you are ready to go. The basic grafting cut is a sloping cut that leaves you with a flat surface, some 2.5 to 3 cm, across the wood. To achieve that, you have to slide the whole blade, bottom to tip. You start by placing the bottom of the blade on the top side of the wood that you are holding, close to your hand, at some 30 degrees angle, then you pull it towards you, sliding it in the wood towards the bottom and all the way to the tip, like below. You start with the scion wood (the 'stick' of wood that you have chosen for a specific cultivar of plant that you want to grow - taste, appearance, whatever that is for) and need a clean cut: as flat a surface as you can muster, as it will need to adhere perfectly to the matching cut you are going to make in the rootstock (which you have chosen for the qualities of the roots i.e. disease resistance, dwarfing stock etc). You can tell if the cut is flat when you place it against the blade of the knife. Once you are confident on your cut, you can decide to go for it. I have described the procedure for whip and tongue grafting before, so I won't repeat it, but there were a couple of different things in bench grafting, which I noticed. First, the scion stick is longer, 15-20 cm with at least five buds: you don't risk knocking it off that much at a desk as you do when standing over grafts made in the field. 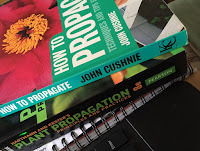 And, because I read in my propagation books that the healing process starts in the scion wood rather than the rootstock, it makes sense to have more wood = more stored energy available. The other difference is in the tying of the graft union. We used a simple elastic band instead of grafting tape, and we started at the top of the graft going downwards, which is really easy. Again, it makes sense - in the field, you are standing over the graft and if you start at the top, the scion stick is in the way and you keep knocking into it, but here... super easy! I went home to pot my new apples up! More panes on the ground than on the frame! With my newest plot I inherited a rather wrecked glasshouse. I don't seem to have been overexcited about it, as that is pretty much the only picture I took of it, although I did take some pictures of plants around it, and there are pretty daffs! Anyway, during the most recent Christmas holidays, desperate to take my mind off Brexit and have control over something, I thought it would be a good idea to fix it. I trawled the internet for glass panes, and found that FB marketplace was a pretty good place for it: I got myself a dozen of panes for the price of only a 4-hour round trip. As the panes were different sizes, I also bought a professional glass scorer. I did not use any oil, as YouTube taught me it was not really necessary. I also got some W and Z glasshouse clips, my safety glasses, and thus armed I made my way to the plot. The first thing I realised I needed was a very flat surface, clear of debris. Luckily, my falling-apart shed delivered just the perfect laminate board, so I got myself a ruler and started cutting, with mixed success and a lot of frustration. Anyway, two months on, I finally seem to have cracked it, thanks to random suggestions from peeps on the web and a lot of practice, and I want to share my tips with you, hoping you won't waste as many panes, should you have a go. if the side that has to go is 10 cm or thinner, there is a high chance the pane will shatter if you apply pressure with your hands: use pliers! If you are lucky and the strip is thin enough, it will come off in one go. Otherwise you have to do it bit by bit. Ideally, one would sand the cut surfaces too, especially when they are ragged. I finally managed to do triangles for the roof sides, and that was with great satisfaction! Both sides that needed cutting were taped, to start with. I was going to score outside the tape (recycled tape so it looks a bit tatty by the third pane, but works). Unfortunately, in the process I broke too many panes to finish the glasshouse. Very luckily, I found more panes, thanks to a chance conversation in the office and a lovely colleague, so I will be at it again soon. In the meantime, I have tidied up the weedy inside of the glasshouse. I dug two beds, edged them, and topped them with compost, then re-established the middle path, which was flintstones on plastic membrane. Happy new gardening year to all! As a kid, I remember coming home from school and some plant or other in the garden that was lookin great in the morning would have been hacked horribly, its dignity lost, possibly at risk of never coming back. That would see me fuming with my father, the perpetrator. I knew nothing about plants back then, except generically liking them. I never asked why he did that. I went on, living my life without knowing anything about plants pretty much until I came to the UK and got my first garden. Five years ago I was thought how to prune at Kew (mainly by Rossana Porta and Tom Freeth) and by amazing Bob Lever for the London Orchard Project. That will stay with me forever. It got me the best compliment I could wish for: I was asked to cut a Garrya by half that was shading windows on the side of a building. After I finished, my boss said you could not tell it had been pruned at all. Oh the satisfaction! A little bit more I learnt at Wisley with the Fruit team. And after all I took from my teachers, I have been trying to spread the word. Of course I do it for the plants! This year, the lovely people on my new plot, the Sunnyside Allotment Society, organised for me to give a couple of demonstrations. The first one was this afternoon, in the most annoying drizzle ever experienced on the British Isles... lovely participants nonetheless, and some braved it out till the very end, too! and the patience of the participants! Anyway, for anyone that might be interested, here are the notes from the session, and a compendium of all the pruning posts on this blog.